In the introduction to support vector machine classifier article, we learned about the key aspects as well as the mathematical foundation behind SVM classifier. In this article, we are going to build a Support Vector Machine Classifier using R programming language. To build the SVM classifier we are going to use the R machine learning caret package. As we discussed the core concepts behind SVM algorithm in our previous post it will be the great move to implement the concepts we have learned. If you don’t have the basic understanding of an SVM algorithm, it’s suggested to read our introduction to support vector machines article. For SVM classifier implementation in R programming language using caret package, we are going to examine a tidy dataset of Heart Disease. Our motive is to predict whether a patient is having heart disease or not. To work on big datasets, we can directly use some machine learning packages. Developer community of R programming language has built some great packages to make our work easier. The beauty of these packages is that they are well optimized and can handle maximum exceptions to make our job simple, we just need to call functions for implementing algorithms with the right parameters. For machine learning, caret package is a nice package with proper documentation. For Implementing support vector machine, we can use caret or e1071 package etc. The principle behind an SVM classifier (Support Vector Machine) algorithm is to build a hyperplane separating data for different classes. This hyperplane building procedure varies and is the main task of an SVM classifier. The main focus while drawing the hyperplane is on maximizing the distance from hyperplane to the nearest data point of either class. These nearest data points are known as Support Vectors. The R programming machine learning caret package( Classification And REgression Training ) holds tons of functions that helps to build predictive models. 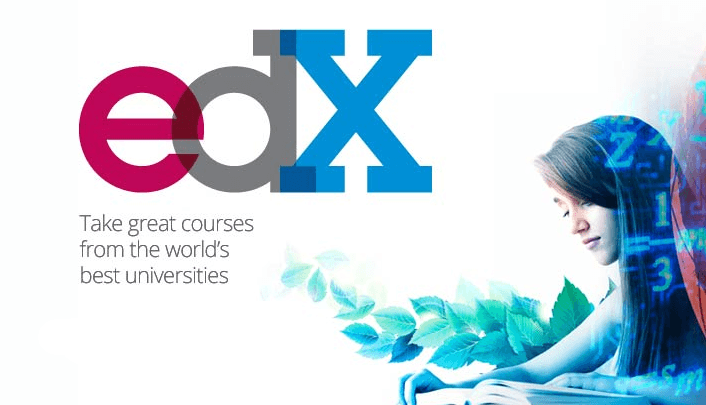 It holds tools for data splitting, pre-processing, feature selection, tuning and supervised – unsupervised learning algorithms, etc. It is similar to sklearn library in python. Heart Disease data set consists of 14 attributes data. All the attributes consist of numeric values. First 13 variables will be used for predicting 14th variables. The target variable is at index 14. To model a classifier for predicting whether a patient is suffering from any heart disease or not. For implementing SVM in r, we only need to import caret package. As we mentioned above, it helps to perform various tasks to perform our machine learning work. Just past the below command in R console to import r machine learning package Caret. For importing the data and manipulating it, we are going to use data frames. First of all, we need to download the dataset. You can download the dataset our repository. It’s a CSV file i.e, Comma Separated Values file. All the data values are separated by commas. After downloading the CSV file, you need to set your working directory via console else save the data file in your current working directory. You can get the path of your current working by running the command getwd() in R console. If you wish to change your working directory then follow the below command to get your task completed. Now let’s read the downloaded CSV file into a data frame. The above output shows us that our dataset consists of 300 observations each with 14 attributes. The Range of values of the attributes are different but all attributes consist of numeric data. The caret package provides a method createDataPartition() for partitioning our data into train and test set. We are passing 3 parameters. The “y” parameter takes the value of variable according to which data needs to be partitioned. In our case, target variable is at V14, so we are passing heart_df$V14 (heart data frame’s V14 column). The line training <- heart_df[intrain,] is for putting the data from data frame to training data. Remaining data is saved in the testing data frame, testing <- heart_df[-intrain,]. For checking the dimensions of our training data frame and testing data frame, we can use these. Our target variable consists of 2 values 0, 1. It should be a categorical variable. To convert these to categorical variables, we can convert them to factors. The above line of code will convert training data frame’s “V14” column to factor variable. Before training our SVM classifier, set.seed(). For training SVM classifier, train() method should be passed with “method” parameter as “svmLinear”. We are passing our target variable V14. The “V14~.” denotes a formula for using all attributes in our classifier and V14 as the target variable. The “trControl” parameter should be passed with results from our trianControl() method. The “preProcess” parameter is for preprocessing our training data. You can check the result of our train() method. We are saving its results in a svm_Linear variable. It’s a linear model therefore, it just tested at value “C” =1. Now, our model is trained with C value as 1. We are ready to predict classes for our test set. We can use predict() method. The caret package provides predict() method for predicting results. We are passing 2 arguments. Its first parameter is our trained model and second parameter “newdata” holds our testing data frame. The predict() method returns a list, we are saving it in a test_pred variable. Using confusion matrix, we can print statistics of our results. It shows that our model accuracy for test set is 86.67%. By following the above procedure we can build our svmLinear classifier. 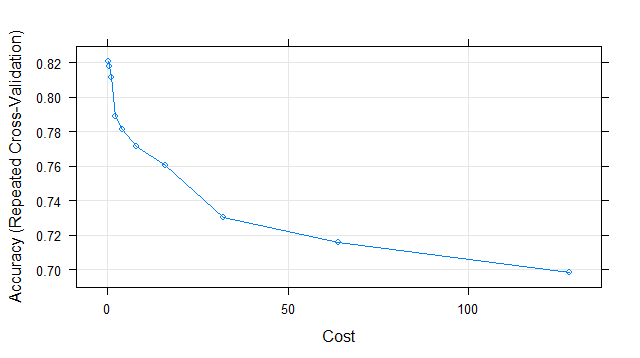 We can also do some customizations for selecting C value(Cost) in Linear classifier. This can be done by inputting values in grid search. The next code snippet will show you, building & tuning of an SVM classifier with different values of C. We are going to put some values of C using expand.grid() into “grid” dataframe. Next step is to use this dataframe for testing our classifier at specific C values. It needs to be put in train() method with tuneGrid parameter. The final value used for the model was C = 0.05. The above plot is showing that our classifier is giving best accuracy on C = 0.05. Let’s try to make predictions using this model for our test set. Let’s check its accuracy using confusion -matrix. The results of confusion matrix show that this time the accuracy on the test set is 87.78 %. In this section, we will try to build a model using Non-Linear Kernel like Radial Basis Function. For using RBF kernel, we just need to change our train() method’s “method” parameter to “svmRadial”. In Radial kernel, it needs to select proper value of Cost “C” parameter and “sigma” parameter. The final values used for the model were sigma = 0.04744793 and C = 0.25. It’s showing that final sigma parameter’s value is 0.04744793 & C parameter’s value as 0.25. Let’s try to test our model’s accuracy on our test set. For predicting, we will use predict() with model’s parameters as svm_Radial & newdata= testing. We are getting an accuracy of 87.78%. So, in this case with values of C=0.25 & sigma= 0.04744793, we are getting good results. 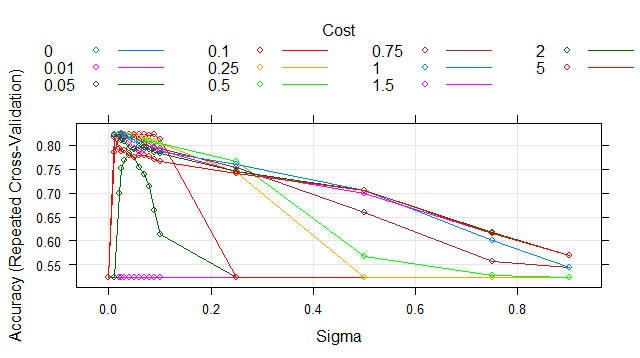 Let’s try to test & tune our classifier with different values of C & sigma. We will use grid search to implement this. grid_radial dataframe will hold values of sigma & C. Value of grid_radial will be given to train() method’s tuneGrid parameter. The final values used for the model were sigma = 0.025 and C = 1. Awesome, we ran our SVM-RBF kernel. It calculated variations and gave us best values of sigma & C. It’s telling us that best values of sigma= 0.025 & C=1 Let’s check our trained models’ accuracy on the test set. For our svm_Radial_Grid classifier, it’s giving an accuracy of 86.67%. So, it shows Radial classifier is not giving better results as compared to Linear classifier even after tuning it. It may be due to overfitting. This is Rahul, here your data have 13 dependent variables and how come you know that all these variables are relevant for this model. Is feature selection is very important step before svm? Could you post a topic on feature selection, feature ranking importance and how can we do it in r studio. Yes, You said correct (y). The main challenging task is feature selection when it’s Machine learning model building. We will try to write an article about the importance of features selections and how to implement feature selection in both python and R.
Hey for some reason the [intrain, ] function doesn’t work on my R, it can’t find it as an object. Could you check the usage of the function once?